Cannot believe that Easter is only a month away 🙂 Did these with the kindergarten class this week. They definitely have Spring fever! Cannot blame them I have it too. The weather has been so nice. I got this 11 x 17 purple card stock that made it easier than last year. Let me know if you do it in your class. And Happy Easter! dot brush stroke, sketching with shapes, making patterns with glue. I started just talking about bunnies and showed pictures of them to the students. 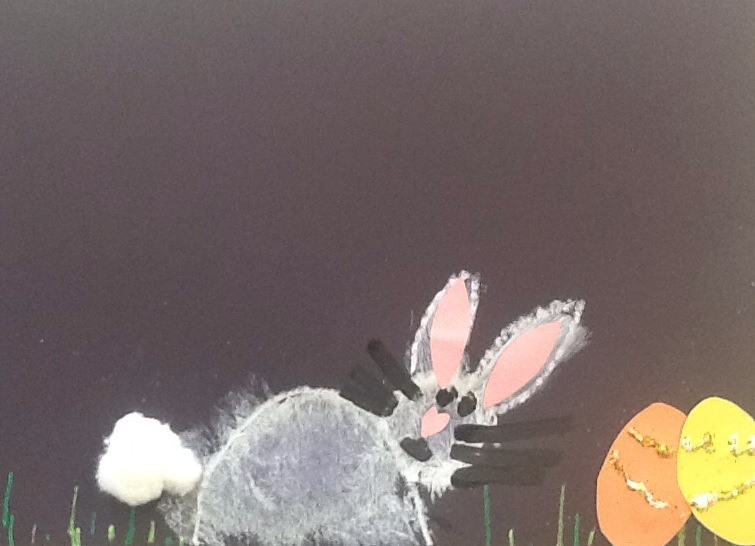 Then we used scratch construction paper and practiced drawing the oval for the body of the bunny and then adding a circle for the head. Once I felt they all could do the sketching we gave them the cardstock and drew the oval for body and circle for the head and small circle for tail with the white oil pastel. Be sure to tell them to make the bunny about the size you did in your sample it will be hard to paint small bunnies. Also have them draw the two curvy lines to make ears on top of their head circle. Remember if they don’t like it they can turn the paper over and use the other side 🙂 No mistakes in art! I am constantly telling my students have you seen a perfect bunny? They are all perfect! Beauty is in the eyes of the beholder. Once we got the body done we handed out the green oil pastels and they did the grass. Be sure to remind them not to put grass in the bunny body some kids will do this and you can use an eraser to remove and paint to cover up. Next we put white paint into the oval and circle and taught them how to dot softly with their brushes this makes it look like hair. Do this in the oval and circle, ears and tail until you cover up their oil pastel. Next pass out the hearts for the noses and let them put it in middle of circle for the head. I had some students make smaller heads so I adapted and cut smaller hearts for them. Also hand out the pink inserts for the ears these will stick to the paint and no need for glue. Now you can discuss the face and how to draw the whiskers. I told them they needed 3 whiskers on each side starting at the top of the heart, middle and then bottom. I used black acrylic because it showed better than tempera but either will work. We also discussed how to paint oval eyes and a line under nose with a smile connected to it. I watched them like hawks with the small brushes with black paint. Take those away right after they are done. We set aside and worked on our eggs. They chose two colors and showed them how to do designs with glue bottles. First I had them glue them to paper in the grass area then do dots, swirls or zig zag designs. Next I passed out glitter they took pinches from my hand and put onto eggs letting sit. Be sure they don’t move or shake their paper the glitter will go everywhere. Not that its bad but it makes for a slippery floor in my concrete classroom. Finish with their names in white oil pastel and you are done.